Arsenal and Liverpool will go head to head for Real Madrid goalkeeper Keylor Navas in the summer if the Los Blancos seal David De Gea deal from Manchester United. Arsenal and Liverpool both have suffered in the goalkeeping position this season. Arsenal are currently experimenting World Cup star David Ospina inplace of Wojciech Szczesny while Liverpool have only one senior keeper Simon Mignolet as Brad Jones is out with an injury. Reports claim that this could only happen if Real Madrid succeed in getting David de Gea from Manchester United. The Los Blancos have been linked with the Spanish goalkeeper in the winter window but the Red Devils successfully kept him at Old Trafford. Real boss Carlo Ancelotti is eyeing to sign him as a long term replacement of Iker Casillas. Keylor Navas joined Los Blancos last summer after impressing at the World Cup. He was also linked with several Premier League outfits but decided to join Real Madrid. 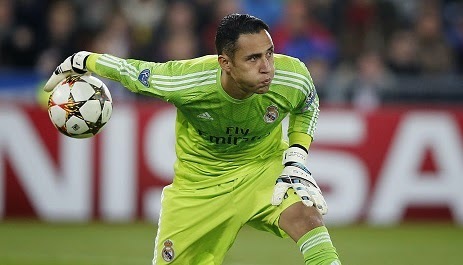 Navas is a second choice keeper, he has only made six appearances for the Spanish giants since his move from Levante. The Costa Rican would be a great addition for Liverpool as they are struggling with the goalkeeping position more than the Gunners.